Playground Inspector for Florida, Broward, Dade, Palm Beach, Miami, Hollywood. If your child has been injured on a playground, a playground injury inspector can gain an understanding of exactly what happened and who was at fault. Our agency, Saffron Investigations, is firmly established as the leading playground injury inspector in Miami-Dade County, Broward County, and Palm Beach County. We help individual families, and we can also be engaged by personal injury lawyers. When you look into the facts about playground injuries, they are very surprising. You may think that there are ample testing mechanisms and supervision in place in just about all cases, but the facts tell a different tale. According to research that has been conducted by the Consumer Product Safety Commission, an estimated 205,000 injuries take place on playgrounds annually, resulting in an average of 15 deaths. Clearly, this is very serious business, and we have extensive experience in this particular area. Our playground injury inspectors are fully certified, and this makes all the difference, because it can be extremely complicated to reconstruct events accurately. Our team members utilize state-of-the-art equipment and techniques to gather the necessary information, and we can provide expert witness testimony as well. Our Miami-Broward-Palm Beach, Florida playground injury inspectors have the ability to examine these situations from a 360 degree overview. There can be multiple different parties that can be held legally liable when a child is injured in a playground accident. Of course, if it happened during school hours, the school and the supervisory element could be liable. At the same time, there are other potential culpable parties, even if there was ample supervision. For example, let’s say that a child was badly injured in a swing set incident on a playground. On the surface, it can seem as though it was nothing more or less than an accident in the purest sense of the word. However, if a playground injury inspector was to dig deeply, it may become apparent that the swing set had a manufacturing defect that caused the event to take place. 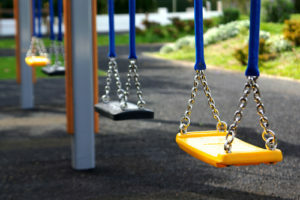 Another scenario would involve the installation of equipment in a playground. The contractor that was engaged to put the playground equipment in place could be held liable if a child was injured because the job was not done correctly. We are standing by to help if you would like to have a discussion with a Miami-Fort Lauderdale area playground injury inspector and expert witness. You can reach us by phone at 754-229-3840, and you also have the option of sending us a message through our contact page.